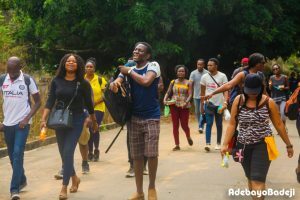 FROM the city of Ibadan to Ado Awaye- a town in Oke-Ogun area of Oyo State , Tour Ibadan- a tourism community of young individuals enthusiastic about the future of tourism in Nigeria and beyond explored the mystery hills of Ado Awaye- home to the second hanging lake in the world. The other hanging lake being the one at Colorado State in United States of America. 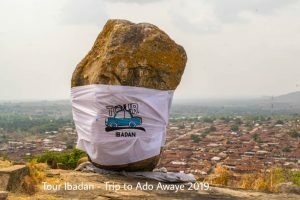 It was for this reason that Tour Ibadan embarked on a breath taking journey to the summit of rock where Iyake Lake is located in Ado-Awaye with over 50 tourists on Saturday, February 2, 2019. It was its third trip since inception in October 2018. 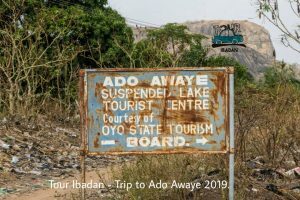 It might not have received the kind of attention it deserves as a tourists destination, Iyake Lake has steadily been turning crowds to the small town of Ado-Awaye. From the slopes, to the hills surrounding the town located in the outskirts of Iseyin -another popular town in Oke-Ogun- the terrain is a sight to behold. 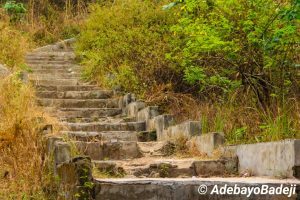 Apart from the Iyake Lake, which is the major attraction on the Ado Awaye hill, there are also other wonders existing on the hill. It takes about an hour to reach the peak of the rock where the lake rests. The water in the lake has maintained the same greenish colour and same level several years. No one knows the depth and it’s obvious not much has been done to offer any scientific explanation as to the origin of the lake. A staircase of about 365 steps starts the journey to the mountain before tourists are left to do hiking where the steps end to get to their destination. 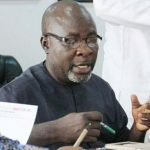 Locals said the the rock has maintained its mystery state to the people of Ado Awaye as it refused to fall or change from its current position. 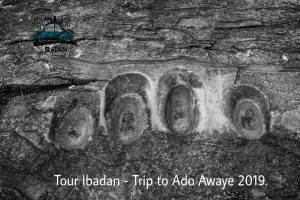 Ese Awon Agba ( the footprints of the elders) is also a defining attraction of the Ado Awaye hill- they are large footprints that are visible in some parts of the hills. It is believed that the ancestors once lived on this hill and the footprints belong to them. 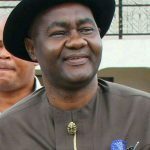 If government at federal and state levels enable a proper management of this tourist site, it would serve as a source of revenue and also, provide employment opportunity as workers would be deployed to this site too.